Boy, we've haven't seen Herbie the Lovebug and Lana Banana in quite some time. In fact, the last time was dinner at Aree Thai. It was nice to see them at Nikta's baby one-month where we chatted about... food of course! Naturally, we made plans to meet up for eats as we left the party. Little did we know it would be that night. With a last minute kiddie shuffle to the Grandparents, we made sudden plans for dinner. 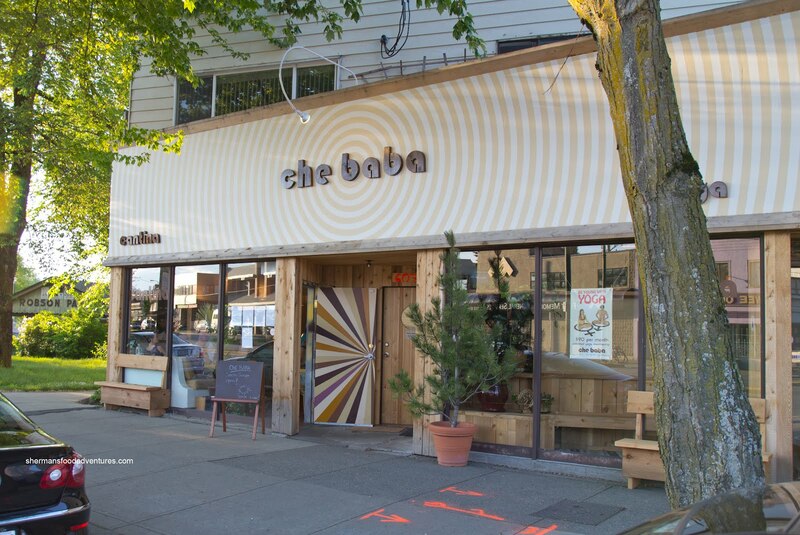 Lana Banana suggested that we head over to Che Baba. Oh yeah, I remember hearing about this place almost half-a-year ago which I subsequently forgot about. 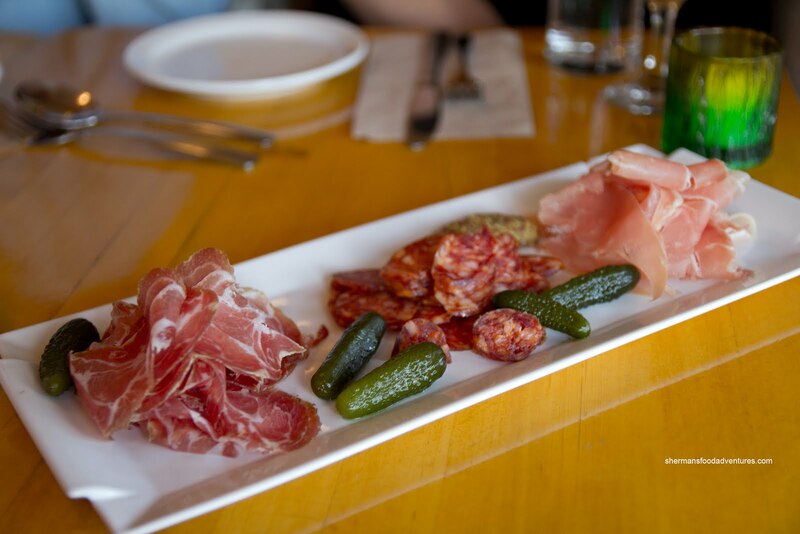 Hey, there is so much to eat in Vancouver! 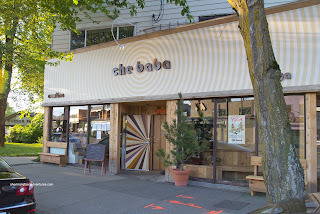 Its proximity to Les Faux Bourgeois is no coincidence since Stephan Gagnon has a part in Che Baba. Hence, the same idea of affordable good eats reside here as well. Nothing on the menu is over $20.00. And much like Les Faux, they don't take reservations here other than parties larger than 6. However, there is an outdoor seating area at the back that is "self-serve" where alcohol cannot be consumed. We were lucky enough to score a table in the small dining room. Being a party of 4, it was a perfect way to practically try all of them mains. Yup, the menu is focused consisting of only 2 permanent entrees with daily pasta and fish offerings. We began the meal with 2 appetizers. Originally, we wanted to try the onion tart, but it was sold out. A good sign really because that meant things would be fresh. Our first appie was the Charcuterie Plate with 2 types of prosciutto, sopressata, gherkins and grainy mustard. Since these plates don't involve any cooking per se, the quality of the product is based on its source. We didn't know where they sourced the meats, but it was more than acceptable. 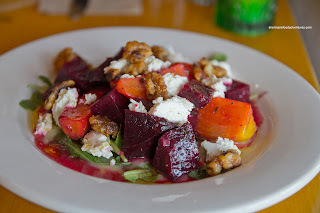 Next up was their Beet Salad which was a fairly large portion for $9.00. On a side note, I would like to point out that the $13.00 beet salad we had at the now defunct Three Lions was 1/4th as large. Not only was the portion large, the salad itself was pretty good. There was large chunks of red and golden beets along with goat cheese, candied walnuts, onion puree and arugula with a lemon thyme vinaigrette. Textures were spot on and I especially liked the crunch of the walnuts. Overall, the salad was pretty good except it was on the sweeter side and a touch wet. For our mains, we decided to share (yay!) and I gave the Prosciutto and Sage Risotto a try first. 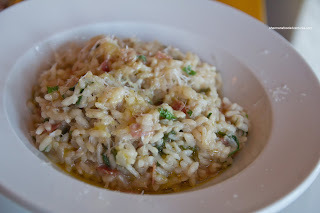 This was a "brothier" risotto as it wasn't exactly creamy nor rich. It did have the right amount of moisture where it hit a good balance between being soft with still a bite. We could definitely taste the saltiness of the prosciutto and the hit of sage with some onions, yet it was very mild. 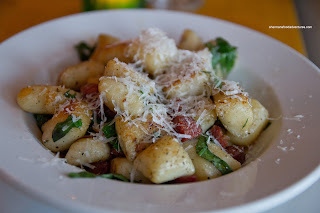 Instead of the fish of day, we went for their other pasta dish being the Gnocchi with basil and chorizo. These large gnocchi were on the denser side, but no one seemed to mind it. I personally like it denser than fluffy, however, these could've been a touch softer. Flavourwise, this was a hit with lots of fresh basil, bits of caramelized chorizo and parm on top. I particularly liked the nice pan sear which added both texture and flavour. Onto their 2 permanent items on the menu, we had the Pork Belly Confit with spatzle, kale, chestnuts and roasted apple finished with pork jus. First off, the pork belly was money. The darn thing was melt-in-our-mouths tender. 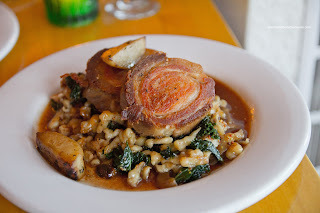 The sear on both sides of the rolled-up belly added even more flavour and a touch of texture. The spaztle was flavourful thanks to the addition of grainy mustard except, it could've been less soft while the kale was perfect. We loved the addition of roasted apple which of course, complimented the pork nicely. 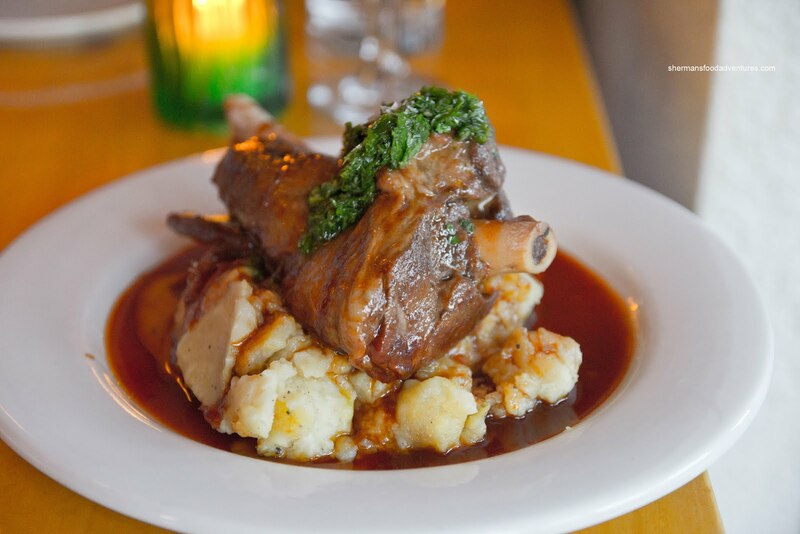 Our last entree was the Lamb Shank with celeriac and potato mash, mint and a velvety jus. This was a fairly large portion for the price where the lamb was beautifully prepared. It wasn't very gamy and exhibited the desirable gelatinous quality. The mash had a rustic consistency to it being chunky, rather than creamy. This worked in this case since it helped soak up the sauce. Although there was a fair amount of sauteed mint on top, it was very mild and only provided a hint of brightness. 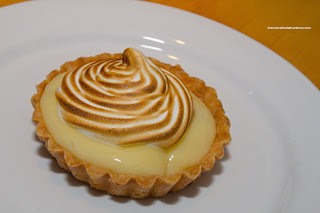 For dessert, we first shared the Lemon Tart topped with an attractively torched meringue. Immediately after the first bite, I was pretty happy with the crisp thin tart shell. The custard was silky and tart while being very sweet at the same time. This would have been nearly perfect if there was a little less sugar involved. 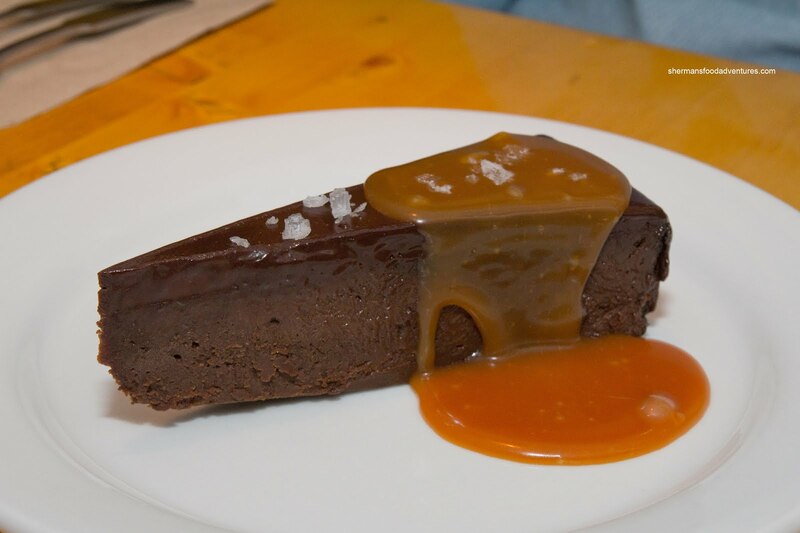 Our second dessert was the Flourless Chocolate Torte with caramel sauce. Despite its plain appearance, this torte was very good. The texture was smooth while the flavour was rich with a smoky chocolate aftertaste. The caramel sauce was surprisingly semi-sweet. The flavours were heightened by the sprinkle of salt on top. At the end, we had gobbled up every little piece. This was a fitting end to a relatively good meal. Sure, not everything was perfect, but really what is? For a reasonable price, we enjoyed a nice meal with great service. Sounds a little like Les Faux doesn't it? @Carolyn It is indeed good for the price. Thanks for reading!